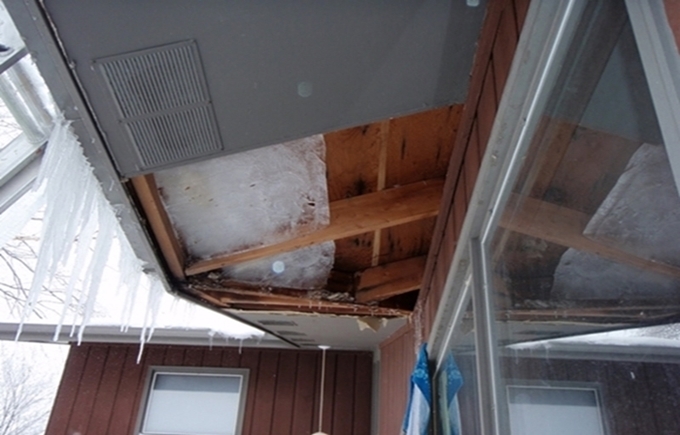 Ice dams in Massachusetts are an ongoing nuisance and are causing extensive damage to soffit cavities, fascia boards, roof sheathing, shingles, gutters, and living area walls. This ice build-up and wet walls can absolutely be alleviated, but every house tends to have a different situation as to why this ice dam has accumulated in the first place. It snows and your entire roof surface will continue to accumulate this falling snow while the temperature outside of your home drops below freezing levels. 1.) For those homes that are insufficiently insulated, the temperature inside your attic cavity will be above the freezing levels (warmer), due to the heated living area (below the attic floor or cathedral ceilings and inside wall cavities) allowing the living area heat to escape and infiltrate the insufficiently insulated attic cavity, thus raising the temperature of your roof cavities and roofing material to above freezing. 2.) Because of the temperature differential and the warmer roofing material, the snow on top of the roof will start to slowly melt. Due to the slope of the roof, the melted snow (now water) starts to cascade down the roofing material (underneath all the accumulated snow) in an attempt to drain off the roof and into your gutters. 3.) As soon as the water reaches the most outer edge of the roof, (where this outer roof edge will not be as warm as the attic cavity itself) it gets exposed to the freezing cold air. The cascading water will now freeze into an ice mound (that literally clings to your roofing material) along the outside edges of your roof and the gutters (if applicable). 4.) As more and more melted snow (water) continues to cascade down your roof, it continues to freeze behind and on top of the previously frozen run off, forming a much larger ice dam which now acts as a curb. Once this ice dam takes shape, it will literally trap the remaining water that is attempting to drain down and off the roof. Now, all the water from the melting snow is completely dammed and has nowhere to drain to, so it simply accumulates into thick ice mound at the roof edge. This accumulating ice is now backing up and is forced right under your most outer roofing material. Once this ice accumulation breaches the roofing material and enters the warmer attic cavity, it starts to melt and the dripping water will now seep right into your soffit and upper wall cavities. This water infiltration will now drip down into your living area wall cavities, causing expensive moisture damage and mold accumulation within your entire wall structure. This is when you will be observe nuisance brown staining throughout your interior walls and exterior siding. Now, every wet wall must be completely removed in order to access and remove wet insulation within the stud cavities and to mitigate all moist wall materials before mold accumulates. If you wait too long to breach your walls, mold is imminent and will require you to hire a licensed mold mitigation company to mitigate all mold accumulation throughout all affected wall structures. 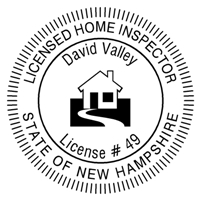 Attention Home Inspection clients: If Massachusetts Home Inspections does report (on page 12 of your home inspection report) that ice dams have occurred in the past, it would be impossible to inspect for past damage to exterior roof edges and concealed wall cavities below the ice dam areas. At this point I highly recommend obtaining contractor paperwork (from the Seller) to prove that past ice dam issues have been resolved. If proof of ice dam remediation can not be obtained, I highly recommend hiring an industrial hygienist to perform mold testing within your prospective home before the closing date. If mold is professionally detected, this will require a very costly remediation. You can then negotiate the costs of remediating all areas of concern. When a deep snow accumulation on your roof field becomes excessively uneven, this is indicative of an improperly insulated attic. The heat from your living area is escaping into your attic, causing the snow to melt unevenly. Your objective is to heavily insulate your attic so heat does not escape. Your attic cavities should be the same temperature as the exterior of your home and the snow on your roof should remain even throughout the winter months. The heat that is now infiltrating into your attic cavity will now rapidly melt the snow on your roof field, which in turn will cause nuisance ice dams. Note the heavy ice accumulation building up on this roof edge. 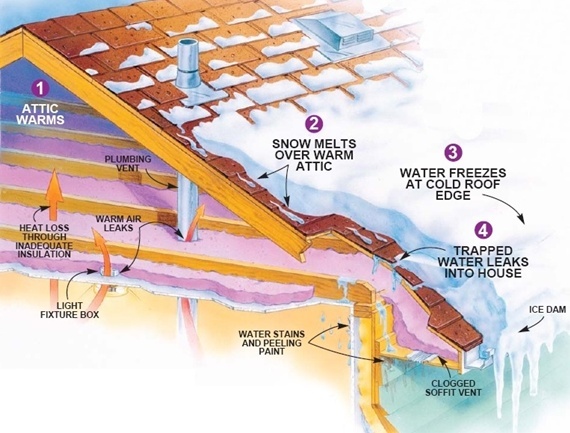 This type of ice build-up can lead to a very costly remediation once the melting ice breaches your roof shingles and starts to drip onto your interior walls and ceilings below the ice dam accumulations (See #4 above). When a thick ice dam does form on your roof edge, this is what your soffit cavity will look like when you open it up. Preventing this thick ice from forming on the edge of your roof in the first place is absolutely preventable. Many homeowners are continuously researching articles on “HOW TO PREVENT ICE DAMS” and they learn that proper insulation and ventilation is necessary to prevent these ice dams. That’s fine, but after most homeowners obtain their education on “HOW TO PREVENT ICE DAMS” they may attempt to save money and correct their ice dam situation themselves, but remain baffled and are unable to figure out exactly where any improvement is needed. That’s why they call me in to assess their existing situation. I'll literally walk home owners through their situation and show them how to properly alleviate this nuisance ice build-up. The solution to alleviate your ice dam issues is the simple use of Infrared technology combined with my professional experience in dealing with many ice dam situations in the past. 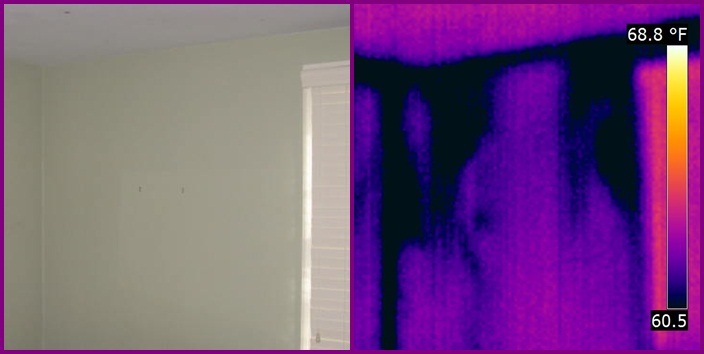 My infrared inspection is a brilliant method of providing you with an instant snapshot of any active heat loss that is seeping through your living area ceilings and the most outer portion of the walls of your home. Deficient insulation is a poor insulator, which allows it to now become a great conductor of your conditioned living area air, and this is what enables me to easily detect the inefficient insulation applications throughout your home. Infrared imaging will visually show thermal mapping of any improperly insulated ceiling and wall cavities that are causing the ice dams at the outer roof edges and walls of your home. Even though attic access is convenient in order to determine what is causing the ice dams in the first place, Thermal Imaging does not require access to your attic, or your ceilings and walls. Infrared will easily detect uninsulated (or under insulated) surfaces of your home as long as there is a temperature difference of 15+ degrees on the opposite side of the surface being thermally scanned. Infrared detects insulation issues above this bathroom ceiling. The brown ice clinging to this particular siding was caused from excessive ice dams at the eave area. An ice dam accumulated lots of ice and water inside the outer edges of the attic cavities (which is right above your outside walls). When the ice dams finally melted from exposure to the sun and from living area heat loss due to the inefficient attic insulation, the excessive moisture (from the ice dams) dripped down inside the soffit (that was full of dust and mice droppings) and then down into the wall cavities. This dirty dripping moisture then permeated the building materials, wall insulation and cedar siding and then leached out of the lower openings of the siding courses as a dark brown liquid. This liquid then iced up as it hit the cold air again and caused this massive brown mess that you see here. You can see here how this messy brown liquid seeps right out of the soffit area and leaches out from behind the clapboard siding. This church had ice dams with darker brown liquid leaching out of the fascia and siding below the belfry soffit. Homeowners can simply pull away any accumulating snow off of the edge of their roof with a snow rake, but... by the time they perform this clearing, it's already too late. Look at the image below where a homeowner decided to pull the accumulating snow off of their roof edge (thinking that the ice dam will not worsen) but discovered that a 4-6 inch thick ice sheet is coating the entire roof edge at least 6-8 feet up the roof field. This thick ice sheet is clinging to the roofing material and is almost impossible to remove it at this stage. If they would have only taken preventive measures to avoid this ice dam in the first place, this area of the roof wouldn't be a concern.